Member of the Connecticut Council of Car Clubs. As local classic car owners, we gather to share our interest and have some fun as a group with our cars. 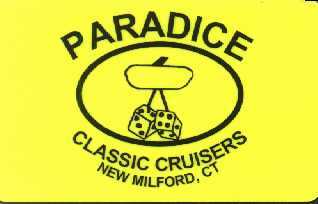 We welcome as members, present, past or future classic car owners and those who just have an interest in customs, antiques, street rods and special interest cars. We arrange periodic car cruises through the lovely New England countryside to vineyards, museums and other special venues. We co- sponsor some local car shows and raise money for area charities. Most of all, we have a great time with our cars and friends! We invite you to tour our web site and join us!. If you have any ideas about making this web site more useful or informative bring your ideas and suggestions to our next meeting.